or: Zack Snyder's kids film. One word to sum it up: Pretty. Back when Legend of the Guardians: The Owls of Ga'Hoole came out, I got a little confused. Since when was Zack Snyder, director of 300 and Watchmen, making a kids animated film with a whole lot of Australian actors providing the vocals? I didn't even know Zack Snyder would want to make a kids movie. But interesting things happen, and Guardians (ridiculously long title) was actually pretty choice. Well, the visuals, more than anything. 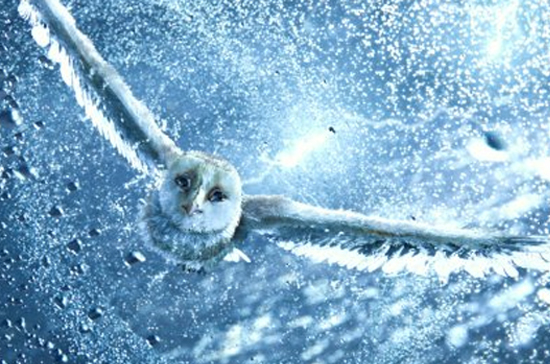 The film follows Soren, a young owl enthralled by his father's epic stories of the Guardians of Ga' Hoole, a mythic band of winged warriors who had fought a great battle to save all of owlkind from the evil Pure Ones. While Soren dreams of someday joining his heroes, his older brother, Kludd, scoffs at the notion, and yearns to hunt, fly and steal his father's favor from his younger sibling. But Kludd's jealousy has terrible consequences--causing both owlets to fall from their treetop home and right into the talons of the Pure Ones. Now it is up to Soren to make a daring escape with the help of other brave young owls. Together they soar across the sea and through the mist to find the Great Tree, home of the legendary Guardians--Soren's only hope of defeating the Pure Ones and saving the owl kingdoms. Guardians doesn't really seem to have a target demographic. It's dark theme is surprising, but may come off as a little scary to the under 7's. However, the film has one of those stories which seems to have enough tension and whatnot for only the young, as it doesn't really go anywhere, like it should. With those two notions in mind, Guardians is a visually stunning movie, which is exactly what one could expect from Zack Snyder. I can't even begin to imagine what it was like in 3D, but even watching it on my trusty laptop screen I was blown away by it's attention to detail. Literally, every feather was perfect. Snyder's use of slow-mo also helped this movie become the visual spectacle that it is. If anything, this movie is definitely a case of style over substance, but I didn't really mind. The vocal cast in the film is amazing. I guess it took until now for me to realize how many great Aussie actors there are. Abbie Cornish, Emily Barclay, Joel Edgerton, Geoffrey Rush, Ryan Kwanten, Anthony LaPaglia, Sam Neill (well, technically, he is a New Zealander, but like most of our other famous stuff, the Aussies jacked him off us), Richard Roxburgh, Essie Davis, Hugo Weaving and David Wenham all provide their Aussie accents to the movie, and to be honest, that is a pretty great lineup. Helen Mirren also makes an appearance. However, the role of Soren is voiced by Jim Sturgess, a British actor, who puts on a pretty damn good Aussie accent for the film. While the visuals and the vocals are brilliant, the premise and script doesn't really live up to them, even though there are some good laughs here and there. But I enjoyed it a lot more than I thought I would, though I don't know how much the younger kids would get out of it. THE VERDICT: As visually spectacular as it is, Guardians script doesn't quite cut it, but that doesn't really matter when it is so nice to look at. Zack Synder is probably one of my least favourite directors, I hated 300 and Watchmen and wasn't impressed by this film. Of course the visuals were fantastic but the story seemed like a massive blend of cliche's with owls thrown in...I mean what the hell were those baddies, they seemed like Nazi owls to me, with their "pure ones". great review and I don't really disagree with you much, it's just that I prefer films to have strong stories and not so good visuals to bad stories and great visuals. Good review, I'd probably give it 7 too. Although it was visually stunning, I had a problem telilng the individual owls apart! After a while, they all started to look the same. Jack - I haven't really seen enough of Zack Snyder's work to judge him yet, but I'm usually not a fan of slow-mo which he uses a lot. I agree with you, but I had very little expectations for the movie and I was blown away by it. And come by and rant anytime! Rachel - Thanks! And I had that problem too. But I was surprised at how many I could actually distinguish. Well writen review. This movie was just ok, I do beieve they could of made it just that fraction a bit better. Worth watching though. It could have been made a bit better. Thanks!